The Iowa City Downtown District was chosen as a district to participate in the first round of a national launch of a program from the National Sign Museum; CoSign. Over the course of six months, local artists, businesses and fabricators designed and built twelve pedestrian-oriented blade signs. Due to the success and excitement of the program in 2017, ICDD will be introducing the program for 2019 that will include an expanded program and higher financial incentives at an upcoming workshop on January 31st. The 2019 program will follow the same principles as CoSign 2017 for signage but with a tailored expansion; “CoSign +” is a second program specifically designed by the ICDD. “We learned a lot of lessons in 2017 with the first run. We learned that more significant financial investment from our organization will allow for more creativity from artists and businesses. We also discovered that creative storefront enhancements could be a really dynamic element that will help set our retail environment apart from others”, said Executive Director Nancy Bird. The CoSign 2019 program will run similar to 2017 with matching grants opportunities for the design of creative impactful projecting signage and storefronts. 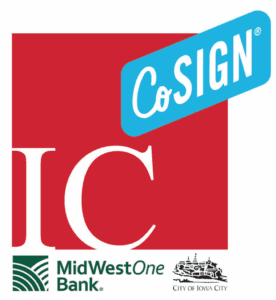 The City of Iowa City and MidWestOne Bank have joined the ICDD again to sponsor the program and to allow for a higher dollar incentive for successful submissions. Businesses applying to be a participant in the 2019 CoSign signage program will be eligible for a $3,000 (with a 50/50 match) grant, or a 50% increase in matching funds from 2017. The new CoSign+ program for storefronts will offer matching grants up to $1,000 for permanent enhancements that creatively improve business storefronts such as new lighting, tiled entryways, substantial paint jobs, exterior merchandising and more. Any impactful improvement will be considered. CoSign and CoSign +projects will be open for application starting in February and all applications will be judged competitively based on criteria from the ICDD Storefront Guidelines and Best Practices study. On January 31, from 2-4pm, at MidWestOne Bank One Place location on Clinton Street, the ICDD will host a kick-off workshop for all interested businesses. The workshop will outline the 2019 CoSign & Cosign + programs in detail. In addition to the Downtown District incentive programs, the City of Iowa City will be joining the workshop to discuss and review the 2019 Building Change grant program. The Building Change grant program is a city-backed facade enhancement program that offers 50% of project costs, up to $50,000 on projects costing a minimum of $50,000. “Attendees to the workshop should expect an interactive session on brainstorming improvements for their storefronts and having all their questions answered about CoSign, CoSign + and the City’s facade support, said Bird. Click here for more information about the CoSign and CoSign+ including calendars, applications, as well as the ICDD Storefront Guidelines which outlines best practices and includes many inspiring examples.